​It's soft, snuggly, and oh-so-soothing-your baby will love snuggling in to the Fisher-Price Sweet Snugapuppy Dreams Cradle ‘n Swing. With two swinging motions (side-to-side and head-to-toe) and a variety of other customizable features, you can choose and combine what your little one likes best. The adorable and ultra-plush puppy seat pad is super cozy (and machine washable. 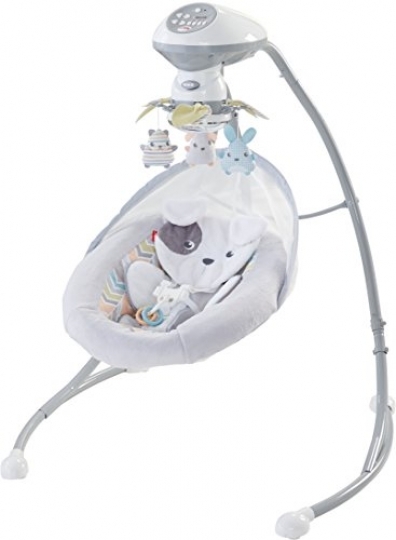 ), and the overhead mobile has three cuddly friends and a mirrored dome for your snuggle bug to enjoy. Plus, the plug-in option saves on batteries, so little ones can relax, swing and play in soothing comfort. Where development comes into play Sensory: Gentle motions, soft fabrics, cuddly friends overhead and soothing music & sounds help stimulate your baby's developing senses. Security & Happiness: Gentle motions, music & sounds provide comfort and security for your little one.